Extreame Savings Item! 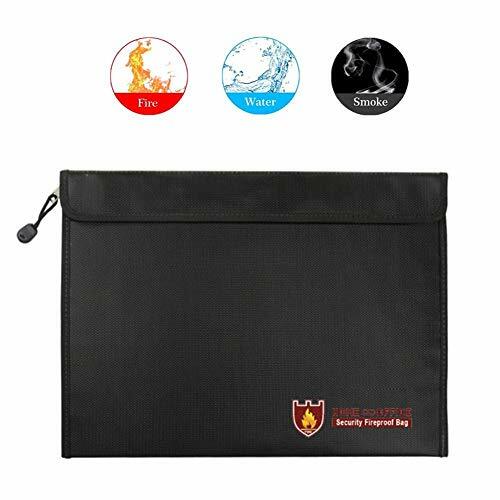 Save 49% on the US-PopTrading Fireproof Document Bag, High Temperature Double Sided Fireproof Safe Storage Pouch File Bag，Water Dust Resistant Pouch Zipper Organizer Case for Money,Passport,Jewelry Black by US-PopTrading at UCBC Group. Hurry! Limited time offer. Offer valid only while supplies last. The surface is made of high-grade fireproof cloth, and the inner layer is made of aluminum foil fiberglass cloth. It is made of fireproof fabric and can withstand temperatures up to 1000 degrees Celsius. In the general fire, valuable information stored inside can be saved and protected with certain waterproof function. The new upgraded material is lighter in weight, beautiful in appearance, superior in quality, and the appearance and feel experience is greatly enhanced compared to the previous generation. Easy to carry, fully protected with hoop&loop double seal. Fireproof bags are versatile and can be stored documents, folders, cash, jewelry, photos, Lipo battery and any other valuables.You need to prepare one respectively in car, office, and home.